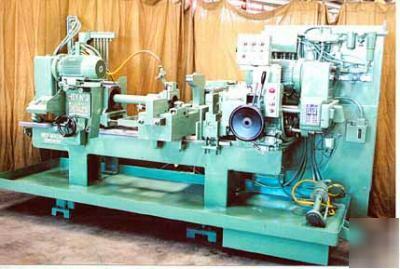 Motor Driven with 15 HP, 3 Phase, 60 Cycle AC Gear Drive Spindle Heads with Controls. Automatic Work Cycling Controls; Quick Advance, Slow Feed (for Drilling), Dwell (For Facing and Quick Return). Automatic Trip. 81/2" Horizontally Mounted Air Operated Self Centering Vises. Spindle Extension. 16" Capacity Hydraulic Auxiliary Vise. Cutter Heads. MD Coolant System. Adjustable DC Braking. Longitudinal Scale. Vise Jaws. Maximum Diameter Work Held in Standard Vise: 8.5"
Minimum Length (Held in Two Vises): 3"
Max. Diameter of Facing with Standard Cutters: 5.12"
Feed Stroke Available with Standard Cams: 1.5 - 2.5"